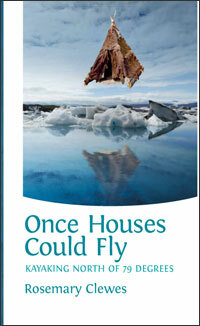 In “Once Houses Could Fly”, ten kayakers snail along the rugged fjords of Ellesmere Island in the High Arctic. Here under the roofless world, the ancient killing fields of the Thule people become campsites for tents, pitched among the bleached bones of sea mammals and the rough docks of shore-ice. These poems speak of the bite and beauty of weather and the limits it sets on us. Be it “Jeremiah on a rampage” or the “which-way of ice,” the polar desert has a habit of dismantling expectations. There is nowhere to hide, no turning back. Beginner’s prowess ends in taking inventory of thumbs and “aging’s howl,” yet the light’s redemptive peace settles all distress, and what lasts is the quiet gratitude that overtakes the narrator, as the journey sets the pace for the soul to catch up with the body. The book re-calls this journey as a summoning to oneself: a humility, which does not anticipate competence, which opens its arms to the unfolding world. The word intrepid appears nowhere in Rosemary Clewes’ compelling account of kayaking in the vicinity of Ellesmere Island north of 79 degrees latitude, but it will occur to the reader who discerns that the traveller is a sexagenarian with a bad back who is paddling well beyond her comfort zone into an arctic realm with no walls and sky for a roof, in silence, emptiness and remorseless beauty. Now that this amazing transformative journey happens in answerable words – on the page – a reader may also venture into the presence of polar bear, Sedna (spirit of the sea), walrus, light, weather, ptarmigan, ice, “a wilderness of stone and deep time.” But the true adventure is inner, “a summoning to myself,” a meditation, a prayer in which silence begins to speak and emptiness to fill with spirit. “Under the roof of the world music multiplies its songs” Listen and be lifted. Rosemary Clewes’ Once Houses Could Fly: Kayaking North of 79 Degrees combines the best of the naturalist’s travelogue with the mystic’s pilgrimage to the ultimate Thule of Ellesmere Island. Her meditative lyrics and narratives on the wild northlands, “this roofless world,” are particularized, gritty, and sublime. In the telling, the land loses none of its archetypal tug and enchantment. Read Clewes’ magnificent poems and be smitten with the Arctic’s fierce beauty, icy waters, and other-than-human life forms and creatures that are its expressions. This volume is not merely a descriptive account of a kayaking expedition, but a lament and celebration of “our cold strongholds of the North” where we are made whole by encountering powers larger, more primal, and more enduring than ourselves. Copyright © 2019 rosemaryclewes.com All Rights Reserved.